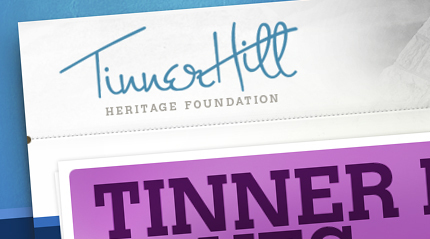 When our neighbors at the Tinner Hill Heritage Foundation talked to us about their annual blues festival in June, we were excited to help them become the premiere blues festival in the Washington, DC, region. 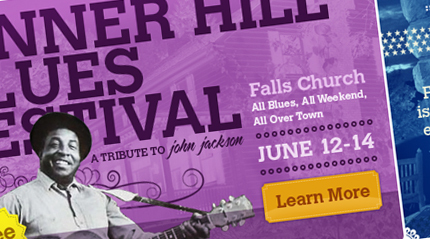 So we helped them on a pro-bono basis to launch a new web site promoting their John Jackson Blues Festival. "We support the City of Falls Church community, and our being on the same block as the historic Tinner Hill made this an ideal project for us," President Andy said. "We're excited to be involved." 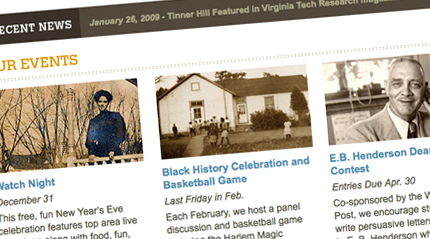 Plus, we gave them a brand new presence for their foundation web site to represent the important community, educational, and cultural work their committed to doing. Working with Viget was a wonderful experience. They are so up-to-date it was mind boggling, yet they are so helpful -- especially to someone who is 'technology challenged.' They make it a point to avoid industy jargon and explain every step in understandable terms. The company is professional, prompt, and personable. All of them were easy to get along with and a joy to work with.